I began my Lenten reading with The Story of Reality, which was a throwback to the narrative of my early Christian walk. Divided into five parts – God, Man, Jesus, Cross, Resurrection – it’s a book that’s meant to be read during Lent. Koukl gets down to business, and quickly, which I appreciate. There’s no waxing philosophical or digging so deep in the text that one needs Matthew Henry’s Commentary laid open for reference. There is a time and place for that sort of study. For me, right now, I’m spread too thin. 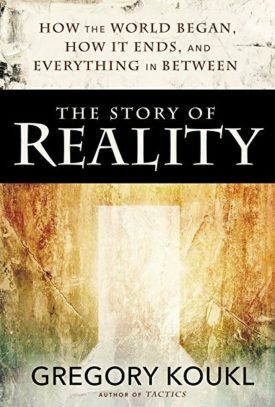 The Story of Reality was an excellent first choice for Lent and starkly different from The Problem of Pain, which I am muddling through right now. (C.S. Lewis is so high brow, so extra.) I’m hanging on to this one and will likely make it required reading for my boys when they’re a little older.